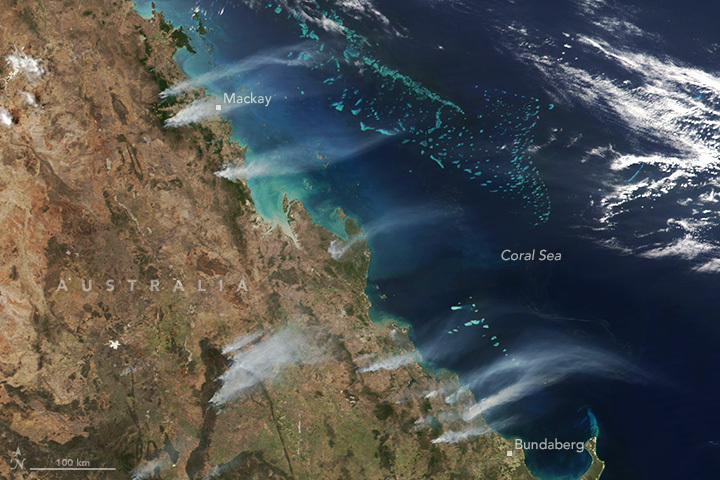 Dozens of large wildfires raged in Queensland in late November 2018 as the state sweltered through an unusual heat wave. 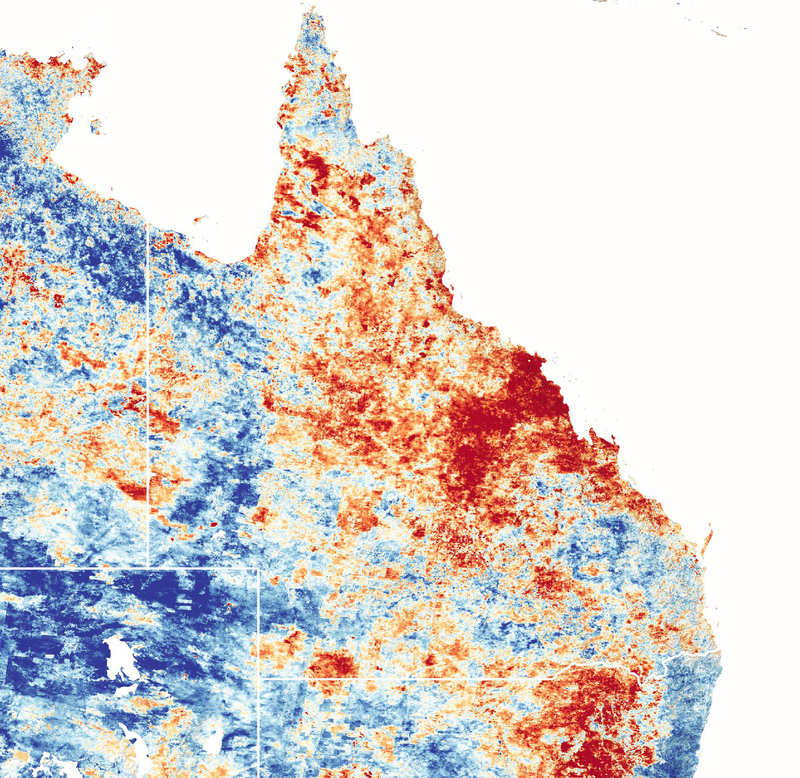 Several cities—including Cairns, Cooktown, Innisfail, and Mackay—broke temperature records, according to Australia’s Bureau of Meteorology. Cairns surpassed its previous November high by a full 2 degrees Celsius (3.6 degrees Fahrenheit). The hot temperatures are clear in the temperature anomaly map below, which is based on data from the Moderate Resolution Imaging Spectroradiometer (MODIS) on NASA’s Terra satellite. It shows land surface temperatures (LSTs) from November 12, 2018 to November 26, 2018, compared to the 2000�2012 average for the same fifteen-day period. Shades of red depict areas that were hotter than average; blues were cooler than average. White pixels were normal. 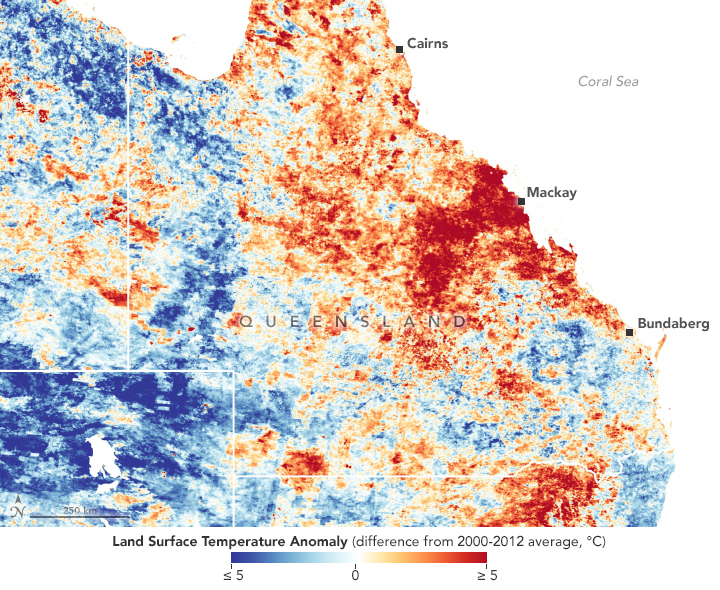 Note that this map represents land surface temperatures (LSTs), not air temperatures. LSTs reflect how hot the surface of the Earth would feel to the touch in a particular location. They can sometimes be significantly hotter or cooler than air temperatures. Small, scattered fires have burned in northeastern Queensland for all of November, but they began to proliferate and grow rapidly on November 24, 2018, following thunderstorms that raked the region with lightning and strong winds. The Visible Infrared Imaging Radiometer Suite (VIIRS) on the Suomi NPP satellite acquired the natural-color image (top of the page) of smoke streaming from several fires on November 26, 2018. Australian officials have called the weather conditions “unprecedented” and “horrendous.” There is also plenty of fuel for these fires to burn because downpours from Cyclone Debbie in 2017 and Cyclone Marcia in 2015 helped build up vegetation in the region. With meteorologists expecting the hot, windy weather to persist, firefighters are bracing for the fires to worsen, and they are urging people to monitor conditions closely and heed evacuation orders. ABC (2018, November 27) Queensland bushfires continue to burn in extreme heatwave, more evacuations ordered. Accessed November 28, 2018. BBC (2018, November 28) Queensland bushfires: Thousands told to flee ‘catastrophic’ threat. Accessed November 28, 2018. CSIRO (2017, November 14) Mapping fire-prone areas before the fires. Accessed November 28, 2018. The Bushfire and Natural Hazard Cooperative Research Centre (2018, July 18) Northern Australia Seasonal Bushfire Outlook 2018. Accessed November 28, 2018. The Courier Mail (2018, November 28) Firefighters battle more than 100 blazes as residents urged to leave. Accessed November 28, 2018. Queensland Fire and Rescue Service (2018, November 28) Current Bushfires. Accessed November 28, 2018.